Okay, now seriously: Hello fellow Speechies, educators, and parents! Happy Spring! As you can see, I have been able to get back to making language calendars. These have been put in Word Document form, to allow easy modifying for clients. Now, an issue that I've been debating with the language calendars is this: developmental appropriateness. The language calendars can't be too juvenile or too difficult, making my task of coming up with appropriate daily tasks difficult. Because of this, I took a hiatus from the Language calendars, and focused on Articulation and Fluency (much easier and less time consuming). 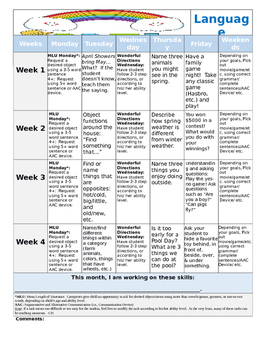 Because of my job change and popular demand, I have started not only my kid-friendly language calendar, I have began making a High School Language Calendar, focusing on vocabulary and reading comprehension.